July 17, 2018, was a busy day for law enforcement at the Palms Inn single- room-occupancy facility on Santa Rosa Avenue. According to police records, the Sonoma County's Sheriff's Office was on-site on five different occasions that day, answering calls for service and following up on tenants. At 11:30am, there was a report of a disturbance. At 12:40pm, the SCSO was there to follow up on a previous incident. An alarm went off again later in the day. Another call was of an unknown variety, according to police records. Just a few days before, on July 12, the SCSO had been on the scene four times at the Palms—to execute the eviction of several tenants. There are numerous instances over a two-year period where the SCSO was on scene at the Palms three or more times on a single day. At first blush, the police records paint a picture of a seemingly lawless facility where the law enforcement has been called out an average of nearly once a day over the past two years. According to data compiled by the SCSO, sheriff's deputies were at the Palms Inn an eye-popping 657 times between May 1, 2016, and mid-July of this year. But "lawless" would be an unfair and unjust characterization. Those numbers only tell part of the story, says the owner of the Palms, along with advocates for the formerly homeless persons who now live at the Palms Inn, which was converted with support from Sonoma County from a budget motel to a federally funded supportive housing facility in 2016. Its residents are a roughly even mix of tenants who were referred there either by the Department of Veterans Affairs or by Catholic Charities. It's emblematic of the "housing first" model embraced by social-service advocates dealing with homelessness and its various fallouts. The core tenet of housing first is that a roof over one's head is the first necessary step to overall stability. Many Palms residents are suffering from acute mental-health issues, says Catholic Charities' Jennielynn Holmes, who says the outsized number of police calls highlights an ongoing problem in Sonoma County when it comes to outreach for mentally ill persons: the county's mental-health crisis unit can't be deployed unless and until there's a call first to the sheriff's office. And there's no on-site mental health facility for tenants at the Palms—and no budget in a cash-strapped county budget that's facing down post-wildfire fiscal fallout. The reported crimes and calls for service provided to the Bohemian range from burglary to robbery, to reports of suspicious persons and vehicles, endangering a minor, battery, domestic disturbances, illegal fireworks, illegal dumping and others. Two calls over the two-year period led to serious felony charges of assault with a deadly weapon. By far the No. 1 code violation in the extensive list of police reports are 415 calls, which are broadly defined as a "disturbance." "There's a variety of calls, as you mention," says Holmes, who chalks the number up to the fact that "this is an extraordinarily vulnerable population, and this is the first kind of project of its kind that's looking at these kinds of people." The numerous and varied calls for service, she adds, "would likely be happening whether they are at the Palms or out on the street, because many of these are about a tenant having a mental-health crisis." Still, Holmes says that there is a lot of police "over-servicing" going on at the Palms, and places the solution in the hands of county mental-health advocates. On the micro level, she says those police reports create an impression that "it looks bad," but on the macro level, she highlights that the Palms Inn has created "a huge positive impact in our community." Now Holmes is looking to tweak the mental-health services to drive those police calls down. "We really need the emergency response system to improve a bit. When there is a mental-health or psychological issue, there's nobody to call but the sheriff. Then they'll get the mobile mental-health team. We really don't have another option other than calling [the SCSO] to mitigate these responses. The [county's] emergency response system needs to evolve in terms of dealing with mental-health crises." 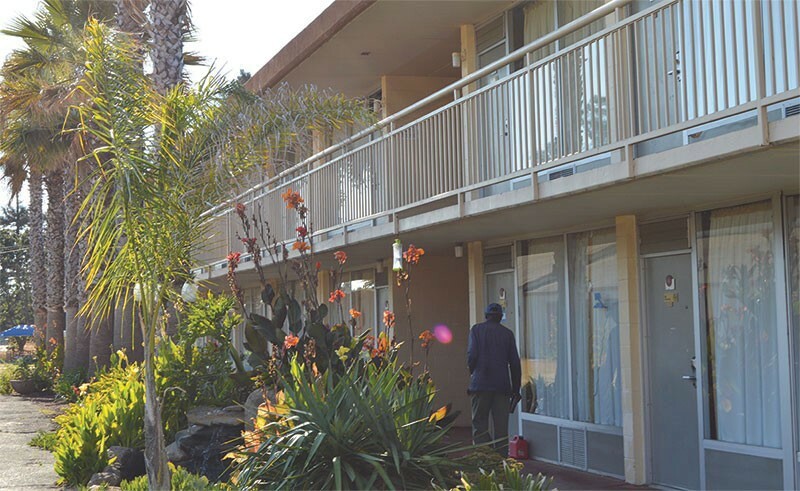 Akash Kalia, the 26-year-old owner of the Palms, says that despite the seemingly large number of police calls to the Palms, he has no regrets about his decision to convert his family's budget motel into supportive housing for about a hundred of the formerly homeless. Just down the road, the formerly low-rent Astro Motel has been converted into high-tone hotel accommodations geared to millennial wine guzzlers. When it comes to upgraded motels such as the Astro, Kalia chuckles and says that's not for him. "It's not about the money. The real value for me is the 'opportunity cost,'" he says. Kalia has been trying to export his hotel-conversion package at the Palms to other regions with big homeless problems, namely Oakland and Solano County. "I want to take it a step further as an example to the rest of the county, and to the nation," he says, "that nonprofits, in order to really have an impact on social issues—there has to be a liaison with business." Even if he's not raking it in with $200-a-night reservations, Kalia sees economic viability for other mom-and-pop type hoteliers willing to convert their hotels into supportive housing. "That's what I want." Along with the introduction of supportive-housing standbys such as on-site case managers and AA meetings, the Palms conversion includes a community garden, and Kalia says he'd like to expand that to a tenant-run commissary featuring local produce and food. "I would want the satellite mental-health clinic on site, too," he says. "The county has budget issues at the moment, and that's unfortunate." A mental-health clinic would only serve to enhance what he says has been a resounding success in its first few years. Despite all the police activity, the Palms, he says, fields a tenant-retention rate of 95 percent. "That's huge and unprecedented for supportive housing." And the calls for police service have been tracking downward as the Palms has settled in to its revolutionary role in Sonoma County. Sheriff's spokesman Sgt. Spencer Crum says that between Jan. 1 and July 30, 2017, the SCSO had 154 calls for service to the Palms and took 25 crime reports. Over that same span in 2018, he says, "we had 102 calls for service and 19 crime reports taken at the same location. So while the calls for service are high, it is not our biggest user of law-enforcement resources in the county, and the calls for service are trending downward." There's a poignant reminder of shared mental-health duress potentially wrought by the October 2017 wildfires on all county residents, rich and poor, housed or otherwise. On Oct. 12, 2017, days after the fires broke out, the SCSO was called out to the apartment complex to respond to a 1056T call for service—that's a person making suicidal threats. The SCSO answered the call, as it did many dozens of others since the Palms Inn opened its doors in 2016. "There is a mobile support team the county funds that can be called out for mental-health issues," says Crum, "but usually we have to come first and make the scene safe, and then we call them out to deal with mental-health-related issues." Meanwhile, incoming Sonoma County Sheriff Mark Essick made a priority of mental-health issues and their intersection with law enforcement during his winning campaign this year. Holmes plans to set up a meeting with him in coming days, she says.